Pub fare and great weekend brunch! Used to be Red Fez, which specialized in Middle Eastern food. Now it's a great sports bar to find some good cocktails and pub fare. Not particularly close to the gay area of town, but very gay-friendly. Nice local pub/sports bar. Went there to watch the Patriots and Packers game. Bartender was a little cold, but waiter was friendly. Crowd was friendly, too. Nice atmosphere. I didn't eat there so I don't know how the food is. It was a good crowd on Sunday night because of the game. Friendly folks, both staff and patrons, lot's of space with a big patio, great drinks and FREE PARKING in the back! this was one of the only restaurants in SoWa. Now there are several w/in blocks of this place. And yes they have free parking and outdoor patios too. Go some place else - I can guarantee you will enjoy the "some place else" more. All this, and a parking lot! With a great patio for outside seasonal dining, and its own free parking lot, The Red Fez is truly a hidden gem of Boston. 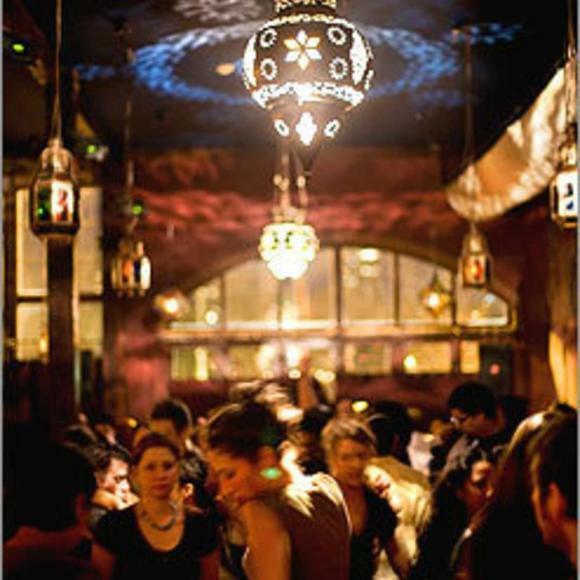 This hip, ecclectic, exotic room features all the Syrian/Lebanese mezzes you'd come to expect and then some, with great touches like pomegranate vinaigrette, great dips and phyllo creations, and a menu that is perfect for sharing, and lingering with their creative cocktails. It's an excellent date restaurant, that demonstrates your Boston insider status and playfulness. Everything we've tasted from apps to lamb, fish, and grape leaves was excellently prepared. On Saturday nights, the meal is accented by live Arabic music. I've enjoyed the place with friends, on a date, or with a large group, each of which they handled with aplomb.